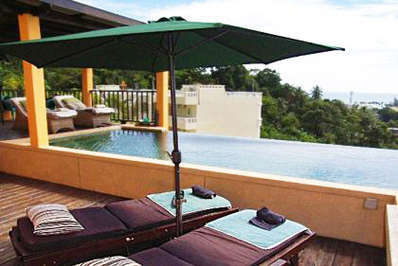 Karon Beach is both a beach and an adjacent town on the west coast of Phuket island, north of Kata. Most hotels are on the main road rather than the beach, so sea facing beach front villas are a prized asset indeed. The beach is 1.5 km long and westward facing, on the shores of the Andaman Sea. The southern area was hit particularly badly by the tsunami, but has now fully recovered. While quieter than neighbouring Patong, it does have its fair share of loyal tourists. The predominant visitor population is from Scandinavia, so a number of business and attraction cater for this specific market. From Phuket Airport you can pick up a voucher from the airport transportation booth for a flat rate of 650 baht. The drive is just under an hour. Taxis will generally charge more. The transportation booth inside the airport also sells minibus seats for around 150 baht. The minibus makes several stops along the way to drop off other passengers so the time of transfer varies. The fastest and easiest way to get around is by tuk-tuk, which provides access to other parts of the beach or nearby towns. To get to Phuket Town, taxis are available and cost around 400 baht, whereas tuk-tuks will be slightly cheaper. Beware of gem scams, though. Some tuk tuk drivers will offer you a low price if you agree to stop at a few gem stores along the way, but there's no obligation to buy, even though the sales people will be pushy. There are public buses which leave from Karon to different places every hour for around 20 baht. The beach is very quiet and so a very good place to relax and enjoy the sunsets over the Andaman. Umbrellas and chairs are available for rent if you want to get right down to the water. In the main part of the town or on the beachfront you'll find cheap clothing markets, tailors, supermarkets, convenient stores and supermarkets. Everything you need is here. While most of the restaurants are Scandinavian leaning, there is still plenty of range in the dining options. The best thing to do is to walk along the beach road at sunset and see which establishment takes your fancy. You can take a kayak out on the water or go jet skiing. Karon is still fairly quiet, though, so water-sports don't dominate.